LG is trying to get back into the smartphone market spotlight with the G7 ThinQ. This display test will try to show whether the decision to rely on different display technology has any consequences. Before we get started, let’s briefly review the key data. The LG G7 ThinQ has a 6.1-inch display with a resolution 3,120 x 1,440 pixels. This results in a good pixel density of 563 ppi. 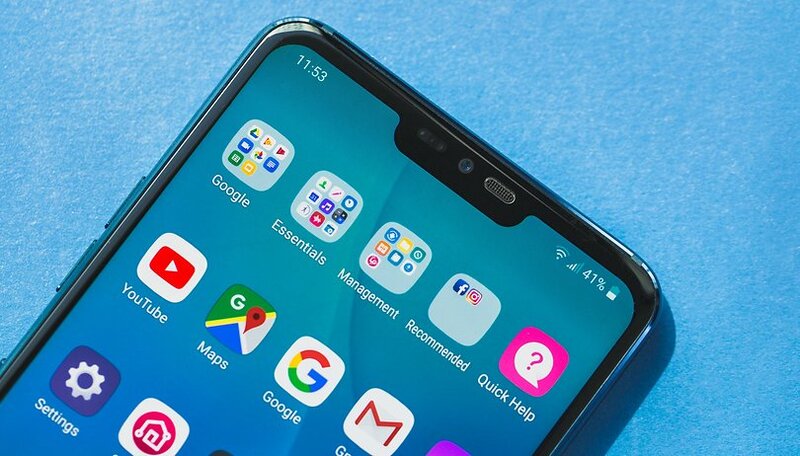 The notch at the top of the display can be hidden by coloring the areas to the left and right of the notch, either in black or in other colors. Unlike most top smartphones, LG uses an IPS panel rather than an OLED display. Among other things, IPS has the disadvantage that it is thicker than an OLED display. In addition, the control electronics require more space, which is why LG cannot do without the wide chin below the screen. IPS displays are usually less intense in color and are not so rich in contrast, but are good in terms of viewing angle stability. The LG G7 ThinQ screen demonstrated these theoretical properties in our test. The colors look natural and aren’t overly bright, but the black areas are not as pitch black as with a good OLED panel. The viewing angle stability is excellent. But the LG G7 ThinQ must also prove itself under the impeccable eye of our measuring device. We measured the most important values, such as brightness, contrast, color space coverage and color distribution, with the Datacolor Spyder 5 Elite. Despite leaving a good optical impression, the measuring device shows that the color balance is not actually completely balanced. Blue is clearly too strongly represented, and you can see that when you look at whites on the screen. There’s also the fact that both the color spectrum (with a Delta E of 9.96 on average) and the gray scales (Delta E of 14.34) are comparatively far from optimum representation. Meanwhile, the CIE color space is more than generously covered and the contrast is excellent at 1.597:1. LG emphasizes the G7 ThinQ’s display boost mode for display brightness. Either manually or automatically, the G7 ThinQ cranks up the brightness significantly for a maximum of three minutes to enable better readability in direct sunlight. LG promises 1,000 nits, and according to the meter, the G7 ThinQ comes close in the display test and at over 900 nits. In normal operation, it is already very bright with 637 nits at 100% brightness. The brightness, together with the IPS technology used, does become a problem elsewhere. The LG G7 ThinQ has an always-on display that always shows the time and the most important notifications. This is of course very informative and practical, but it shouldn’t disturb you while you’re sleeping. The only problem is that’s exactly what it does. IPS not only has disadvantages in terms of design and color reproduction, but also in terms of black tones. They never look completely black, and in the dark you can see that the display still lights up over the entire surface, unlike an OLED. When the LG G7 ThinQ is on your bedside table and the Always-On display is activated, the largely black display shines bright enough to rob me of sleep sometimes. I may be a bit sensitive, and I’m also annoyed by every LED in my bedroom that lights up continuously, but with OLED panels, this problem doesn’t exist. The only thing that helps is to turn the mobile phone over or to turn off the Always-On display, which is a pity, because this feature is otherwise practical. It doesn’t always have to be an OLED display. All in all, I liked the LG G7 ThinQ display in the display test, despite the peculiarities of the IPS panel. I really appreciate the boost mode for use in bright sunlight, the display pleases me in general and it’s not far behind OLED panels. I don't need the Always-On display at night, but I can live with it. What do you think? Is the LG G7 ThinQ a good option in the flagship class in spite of its IPS display? After using Note 3 for more than 4 years and OLED TV, its taking some time for getting used to this display. But at the same time its more vibrant and No Bending (10 bit display and LCD). There is one annoying thing though, if I tilt the mobile to left little bit, I see irritating Blue screen instead of black. And high brighness also causes the same effect in darker environment. "LG is trying to get back into the smartphone market with the G7 ThinQ"... Were they OUT of the smartphone market at any point? Your very first sentence, right out of the gate, is off-base. LG hasn't gone anywhere. They're a constant presence. Hard to take the rest of the review seriously when you start out so poorly. Sorry to jump on you, but that's a bad beginning.